"Permission to hop in an X-wing and blow something up?" Talented squadron leaders looking for top-level X-Wing™ competition needn't look any further than this year's European and North American Championships! Held at the UK Games Expo and Gen Con Indy, respectively, these fantastic events promise to draw hundreds of skillful and enthusiastic players, feature top-tier piloting, and help bridge the game's first and second editions. There will be prizes, of course, and many of them will both celebrate your first edition skills and successes, even as they ready you for the second edition battles to come. Darth Vader was instrumental in defining the Star Wars galaxy, and he's one of the most loved and influential pilots in X-Wing. 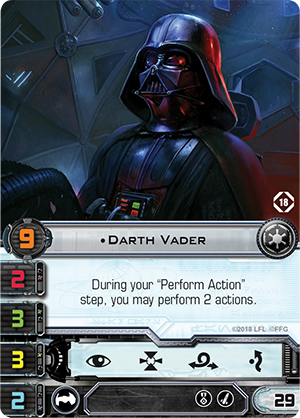 As a participant in either the X-Wing European or North American Championship tournament, you'll carry Darth Vader's formidable skills forward from the game's first edition to its second with a double-sided, alternate art Darth Vader ship card. First edition on one side, second edition on the other—powerful with the dark side of the Force on both. This is the Darth Vader you'll want to use to recreate the scene from Star Wars Rebels in which the Dark Lord of the Sith single-handedly lays waste to the Rebellion's Phoenix Squadron! Win enough games, and you'll qualify for Day 2 and keep your title hopes alive. 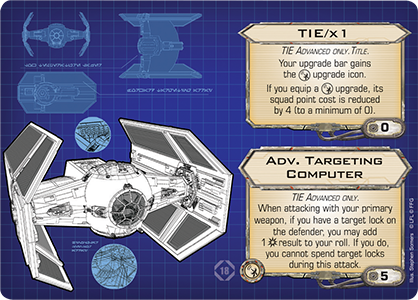 You'll also earn a set of six acrylic target lock tokens—compatible with X-Wing Second Edition. In the game's second edition, these tokens are known simply as "lock" tokens, and you no longer need a pair to acquire a lock. You simply perform your lock action, assign the lock token that matches your ship's ID token, and prepare to fire! Stay on target through the early stages of Day 2, and you may make the Top 64. Given the competition you'll likely face, making the Top 64 is a feat of its own, and you'll find it rewarded by a double-sided plastic card that features materials for both the game's first and second editions. The first edition side features the TIE/x1 and Adv. 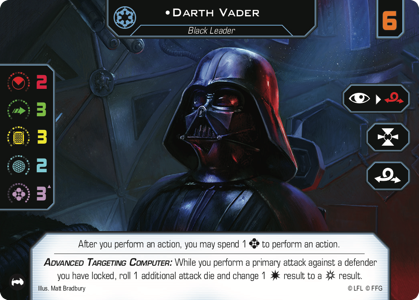 Targeting Computer upgrades paired together—the upgrades you'll most likely want to add to your new Darth Vader ship card. On the other side, however, you'll find the Adv. 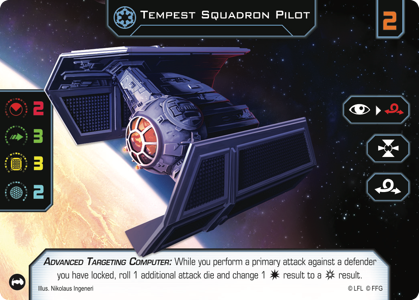 Targeting Computer upgrade built straight into the new second edition ship card for the Tempest Squadron Pilot. Fly your way into the Top 32, and you'll receive a commemorative binder will stand testament to your performance even as it helps you sort and store all the other prizes you've received. 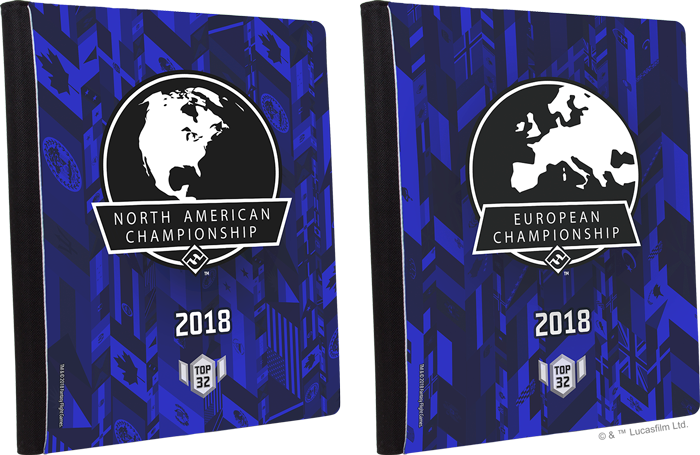 Proudly displaying either the European Championship or North American Championship logo atop a blue background layered with the appropriate flags, this binder holds nine standard sized cards—ship cards and upgrade cards in X-Wing Second Edition—per page and up to 360 cards total. An elastic fastener wraps over the back to keep it shut securely. 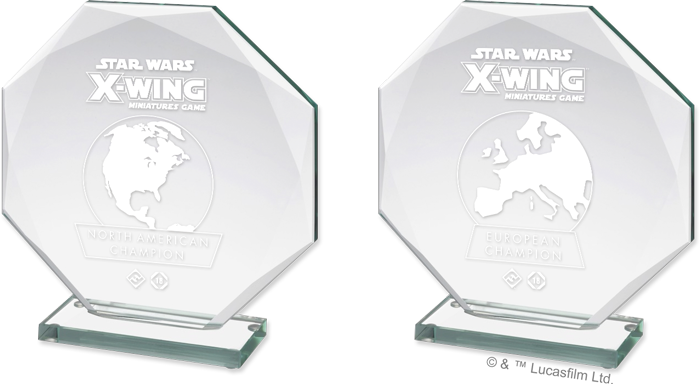 The Top 16 participants at the X-Wing European Championship and North American Championship will receive a medal bearing the event's logo. No matter how perfectly you fly, your squad will almost certainly suffer a load of damage over the tournament's multiple rounds. It's a fact that's true for all the great aces, including Resistance pilot Poe Dameron. To make the Top 8, then, you'll need something holding you together despite that damage. In the case of Poe, that something holding his ship together was his trusty astromech BB-8. And if you make the Top 8 at the X-Wing Eurorpean or North American Championships, BB-8 can help you push your ships through their maneuvers, as well. 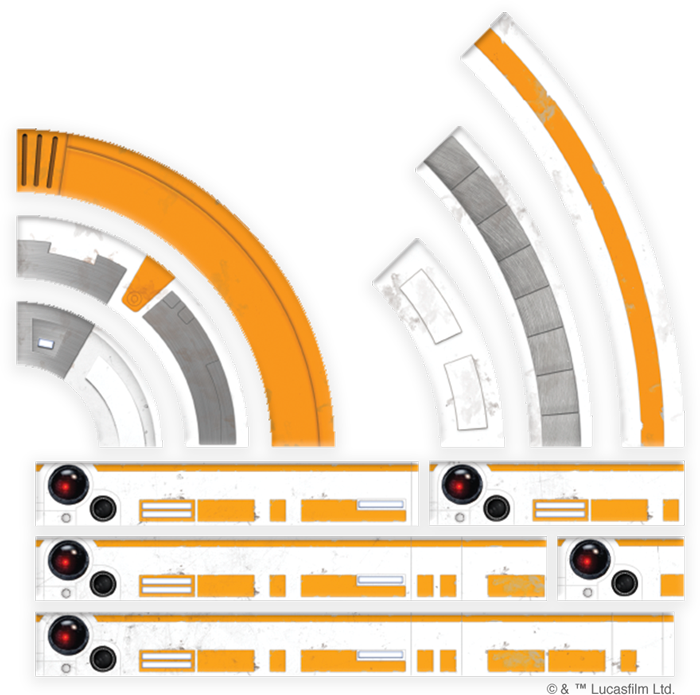 Each player in the Top 8 receives a set of BB-8 themed maneuver templates. As good looking as they are functional, these maneuver templates make it fun to fly—so fun, in fact, you might want to race through the combat and planning phases just to get back to putting your ships through their paces and using your templates! However, there's something new to these templates, as well. Like the cards you'll have already received, these templates are double-sided to accommodate the differences between the game's first and second editions. 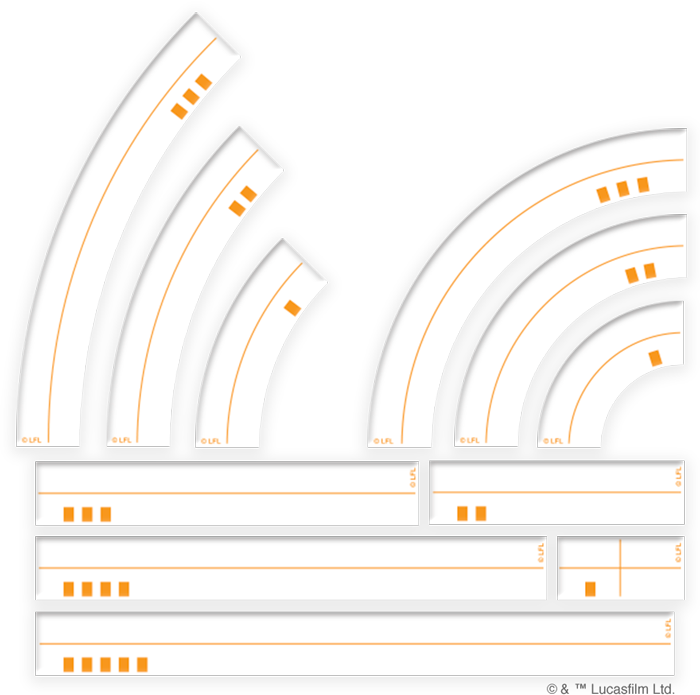 Second edition maneuver templates each come with a guideline that runs down its center. This helps you position your ship accurately should you ever bump, and you'll find this line on the back of these Top 8 templates. Given how challenging it will be to emerge victorious from all the battles of the European and North American Championships, there can be little doubt that the Top 4 aces will all have bright futures ahead of them—and we'll hope to see them all competing for the game's top honors at the 2019 X-Wing World Championships! For their efforts, each of these aces will earn a free event ticket for the 2019 X-Wing World Championships. 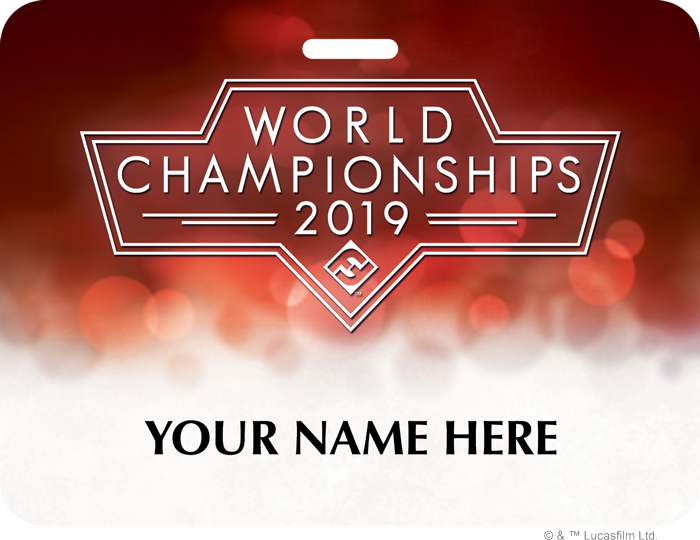 The Runners-Up at the European and North American Championships each earn a first-round bye in addition to their reserved seat and free event entry. More than this, each Runner-Up also walks away with a plaque commemorating his or her placement. The sparks that set the fire that ushers forth the game's second edition! 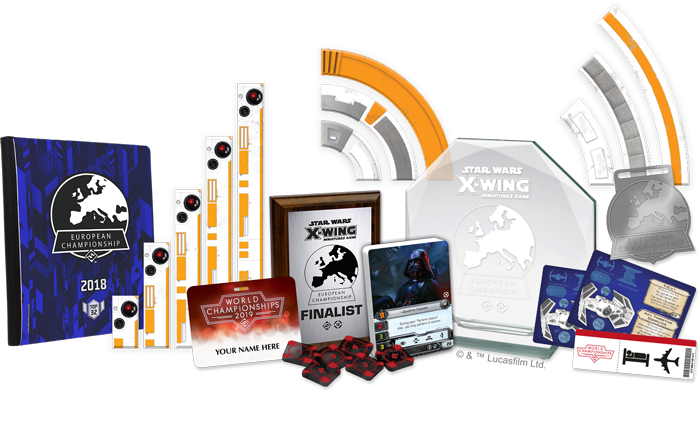 The winners of the X-Wing European and North American Championships will each help push the game forward into its new edition—and along an upward trajectory. 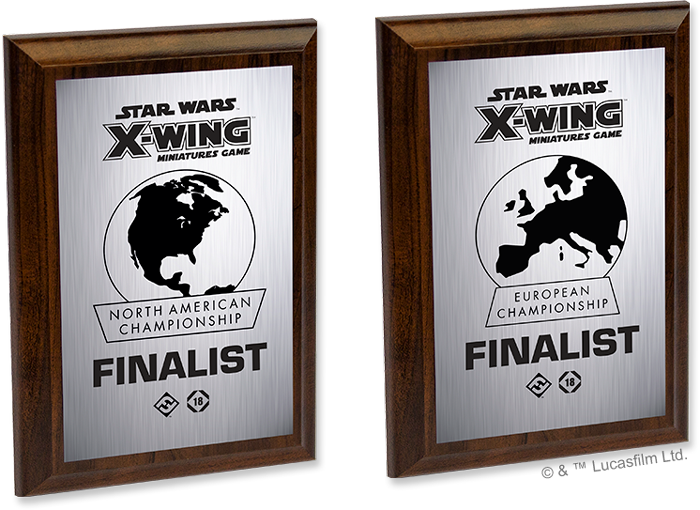 Capping off all the other prizes they've won over the course of the weekend, the European Champion and North American Champion each win a flight and lodging for the 2019 X-Wing World Championships. We look forward to seeing these aces raise the bar at this first World Championship for the game's second edition! The European Champion and North American Champion also win a first-round bye, as well as a reserved seat and free event entry for one guest each. The European Championships take place at the UK Games Expo from June 1st — June 3rd, and the North American Championships will follow at Gen Con Indy from August 2nd — August 5th. Both events are set to transition the X-Wing Organized Play from the game's first edition to its second, and we hope to see you participating. In the meantime, you can learn more about the future of X-Wing Organized Play from the article, "X-Wing Second Edition Organized Play."